Nedko Solakov is one of the most important Bulgarian artists working today. A particular goal of Solakov’s work is to play with the viewer's expectations. 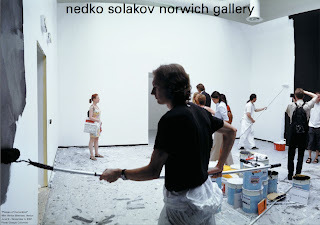 The Norwich Art Gallery hosted an installation of Solakovs work entitled 'A Life (Black and White)'. "This is the first solo exhibition by the renowned Bulgarian artist" (Steve Bell, Guardian Guide). The work consisted of two workers constantly repainting the walls of the exhibition space, one in black and one in white. The painters got a ten minute fag, beer or boredom break every half hour and a half hour lunch break. At any time it was strictly stated that the gallery must be half white and half black with one worker perpetually erasing the others labour. Solakov does not paint the walls himself instead he leaves very clear instructions which are conducted as precisely and meticulously as possible. Solakov documents the piece by retaining both sets of overalls and signs used by the workers. This is the only record of the performance. The work was first presented at the 2001 Venice Biennial, a major contemporary art exhibition that takes place once every two years in Venice. For the full five months, day after day the worker repainted the walls. In a review of the Venice Biennial Fred Hammerquist wrote that "viewers were clearly confused by what appeared to be an installation in progress, but for those who took the time to read the explanatory wall text, this piece was a biting commentary ... Solakov's instructions do not result in a finished aesthetic product, but rather references the futility of both art and humankind." Is this art or are we just watching paint dry?